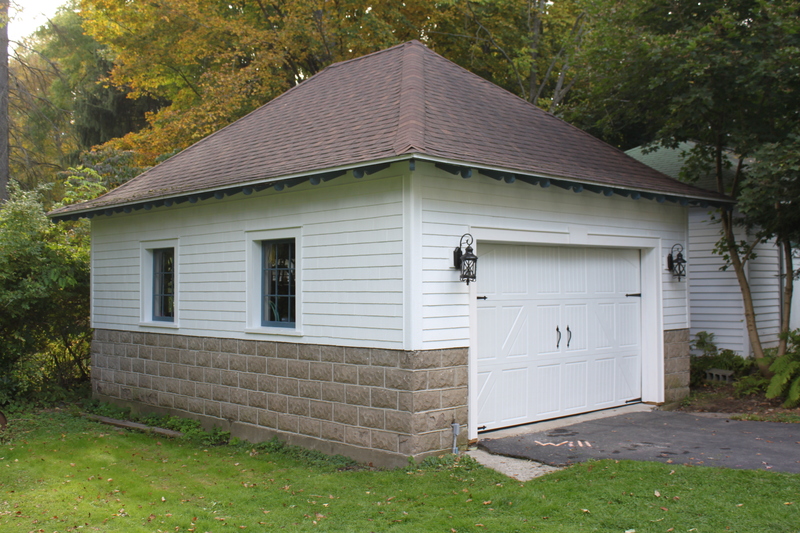 It has only taken 18 months to finish our latest project, the garage. Well, I should re-state. We really have been working on the garage for 4 years and we have yet to truly finish it, but it at least looks finished and I can be happy with it now. 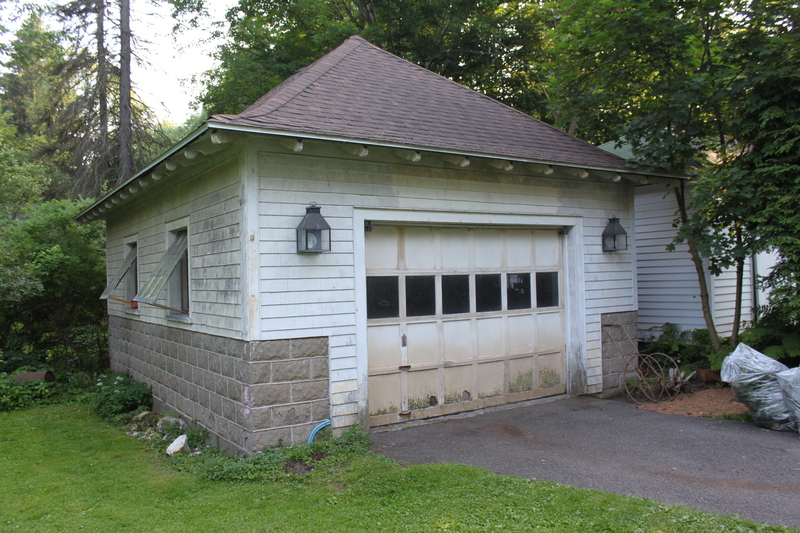 The garage was in shambles, with a full attic and stacked shelves with all sorts of junk. It was probably used to fix up cars and originally it had a wood burning stove in the back with a chimney. Back in 2009, we took down the crumbly chimney and used the bricks to build a walk from the drive to the back door. Bill did that as a surprise for me when I was on a work trip in the spring of 2010. 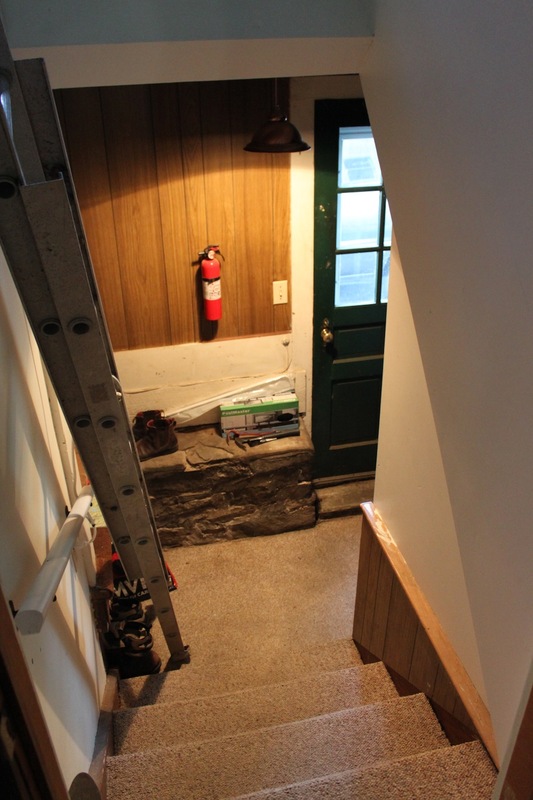 Bill covered the chimney hole with extra shingles we found in the garage and we cleaned out the shelving in hopes we could fit two cars in our 1 1/2 width garage. 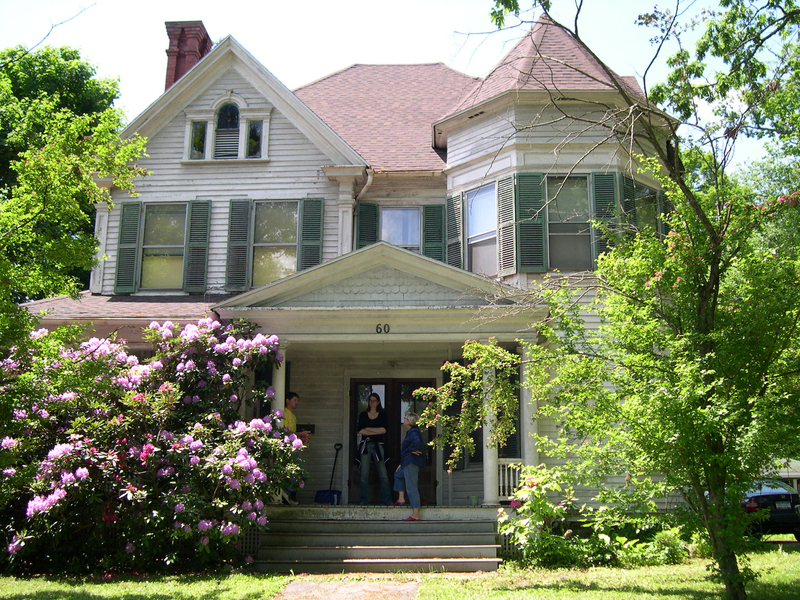 Last summer, we began scraping and priming the exterior, taking down the lights and removing the windows. We didn’t get very far along in the process and the windows stayed open all winter. 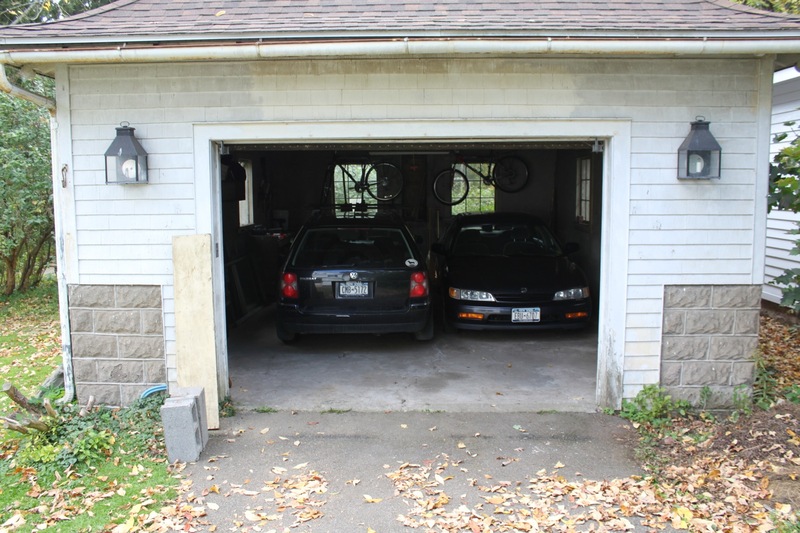 But, we were able to pull both cars into the garage for the duration of the winter storms, even though the narrow door only allowed us to move one car at a time. This summer, we widen-ed the door, put in a whole new door, new lights, new opener and re-glazed the old windows. The garage looks decent and we can use it more easily for both cars. However, the cinder block foundation could use some work in the long run and we will want to eventually clean out the garage attic. Yes, there is a garage attic full of old stuff from long before our arrival. If we do it right, we could put in a dormer and a floor and it would be a great playhouse for Will, especially when he starts bringing his buddies over. But, that is for another summer. Right now, I’m just pleased at how nice it cleaned up and how spacious it feels. With the driveway behind us, we have been focusing on priming the garage. Unfortunately, fall came early this year and we both feel a little behind. So, we hired a little help. It isn’t our style to hire help, but Alex is a great guy and super agreeable to work with. He is our neighbor’s nephew and loads of experience on projects like this. Besides, the priming has been rather tedious for us. We’re using a supremely good primer that goes on white, but dries clear. It fills in cracks and adheres chipping paint to the surface. Sort of like painting with Elmers, but a more stable version. The garage looks plain and simple primed without the first coats of paint. I’m hoping to get some actual color on it today, but we’ll see how the weather cooperates. 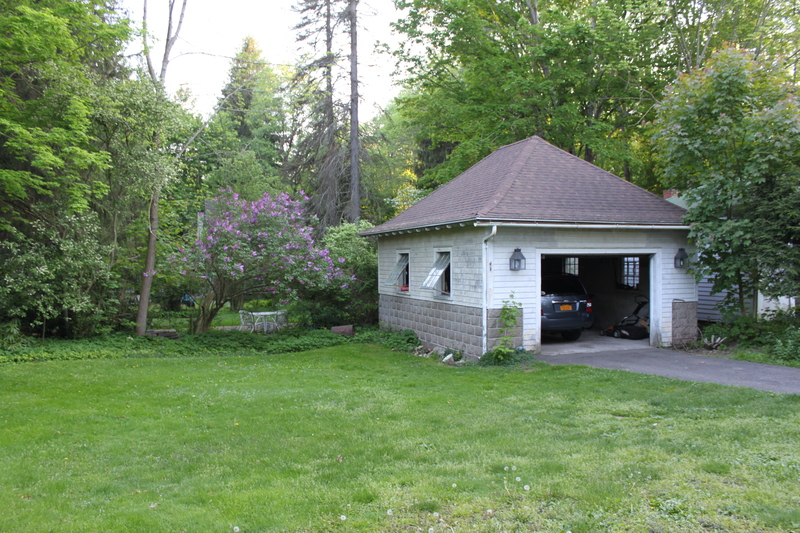 Bill will be fixing and updating the garage door and lights on the exterior. If we get these lights working, it won’t be so dark during the winter when Bill comes home from work, or on nights we go out. We won’t be able to finish everything we need to do to the garage this fall, but this is a good start, to have it painted. We’ll have to repair the brick work and likely put in a new floor at some point. When Will is old enough, we might make the attic a “playhouse” for him by putting in a dormer window. I still can’t believe we get to live in this place. What an amazing house. And what an amazing fall coming. 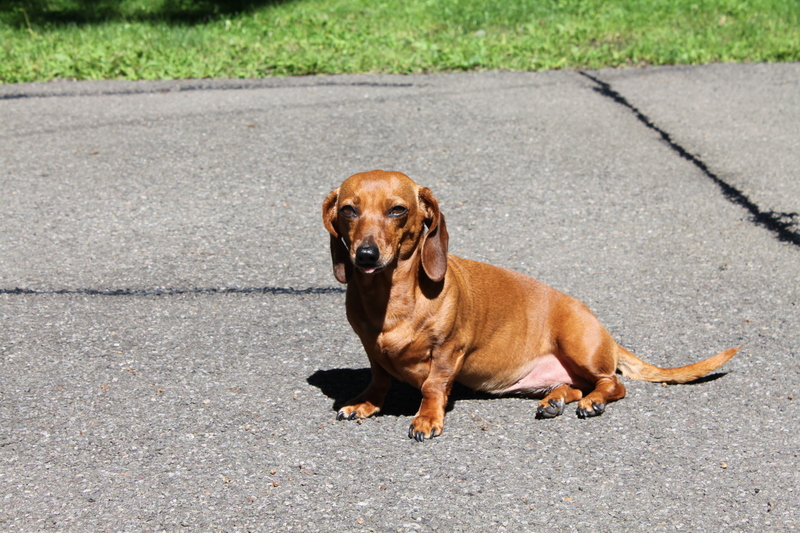 We are savoring our weekends and greatly enjoying this weather outside, although it is a touch hot for my northern boys. However, Bill spent a week up here on his own while I traveled south to visit family and he used the time to scrape the garage. We didn’t have it painted when we originally had the house done as there was no reason to for our mortgage, and we wanted to save some money. So, now that we’ve done quite a bit on the house, we thought it is time to catch up the garage. If we hired outside contractors at this point, we would end up paying a lot as the lead removal laws in NY are stricter now than they were 4 years ago. So taking this on ourselves is both messy and, well, messy. The lead doesn’t come off in quick strips like smooth latex paint. Instead, it really chips and falls heavy. Bill power washed the garage, scraped and sanded while I was away for a week. We’ll have to vacuum the ground and try to scoop out the topsoil with some paint in it, but at least we’ll never have to do it again. Once painted with a primer and top coat, we’ll need to attack the cement or plaster bricks that are the foundation. Some are completely hollow and others need serious repair. It will mean coating them all with a mortar-paint and filling many of them. 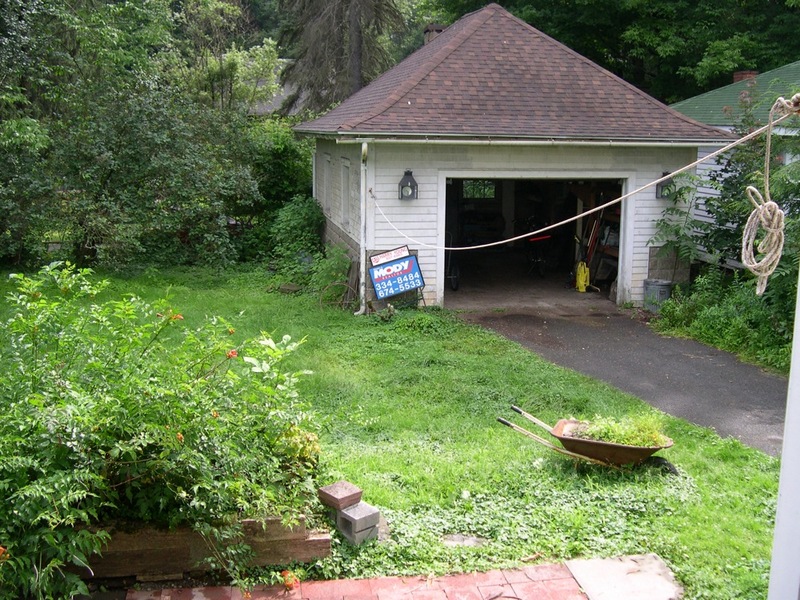 Then, we have to consider a new floor inside the garage and repairing all the windows. We still need to empty the garage attic. That will be a whole post unto itself as who knows what is still up there. I could stand up there, too, if I so chose, but the floor is unstable. Eventually, it will make a super fort for Will. 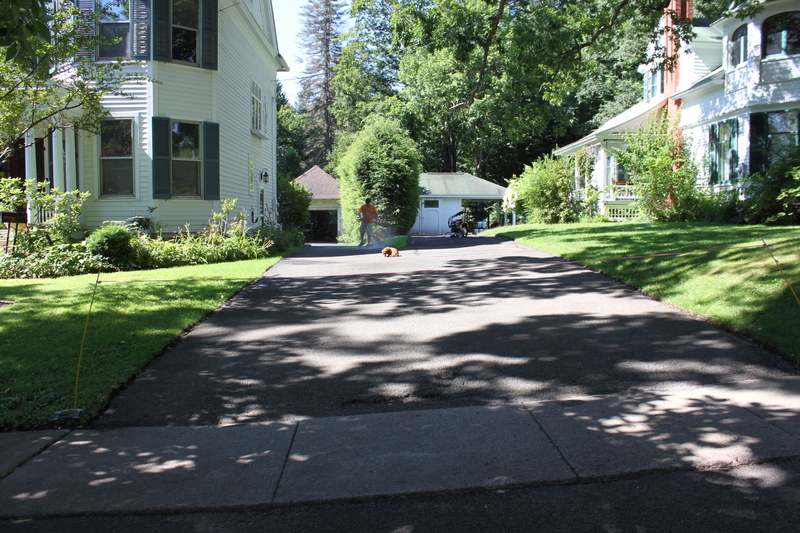 Lots of work and expense to be done on the garage and that doesn’t even include resurfacing the drive. 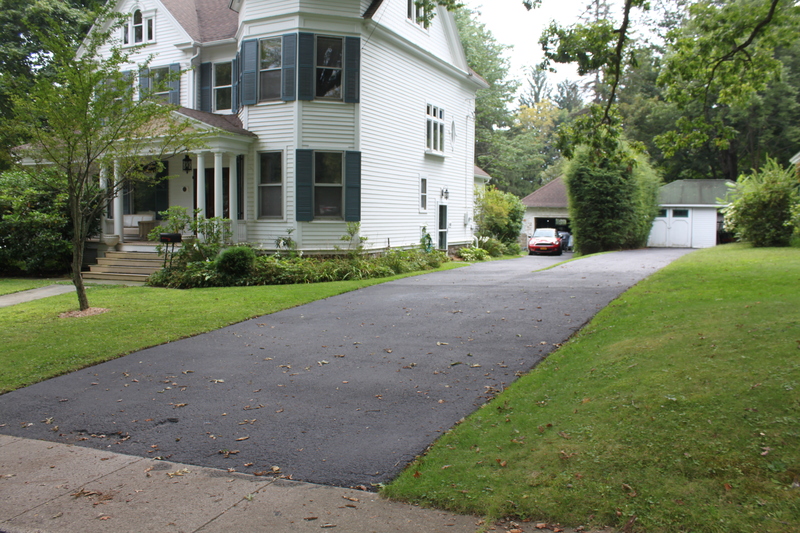 At some point soon, we need to recoat the asphalt drive. The snow and ice are hard on the roads and drives here, so this is a priority, too. So much to do! The summer posts will be full of more outside work and inside detail — stay tuned! It is long overdue that I catch all of you up on the house work. We have been working, but there aren’t a lot of photos to show for it. So, I’ll catch you up on what I can. First, here is a shot of our newly re-organized 2 car garage. In the last post, I wasn’t able to show how we could park everyone in comfortably. We’ve spent a few days organizing and hanging tools to make room for everything, so I needed to share. It’s a tight squeeze, but in the heart of winter, might pay off to keep the cars snow free. Now, on to where we are with the bedroom. It’s now day 19 of the Master Bedroom work. And, Bill is sanding as I type. The plaster is almost complete, we’ll need a few touch ups right before priming. The room is chalk white, except for some of the pink trim showing. If the floors looked good, the room would be pristine. Bill will be finishing the sanding today and we’ll start priming. 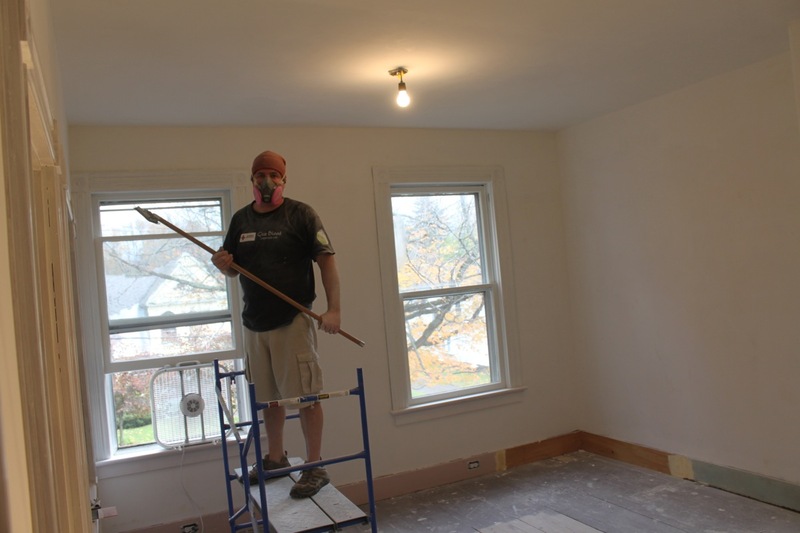 We’re using a shellac primer, which allows us to paint over the old trim, the plaster, anything raw like wood, and have completely even coverage. It’s beautiful stuff. Once the priming is done, I can spend the week painting the ceiling and walls!!! I won’t tell you the colors I’ve chosen yet, to share the surprise in the photos yet to come. We will still need to touch up plaster in the “nook” and then in the closet. We’re lucky to have a rather large closet in such an old house, but it certainly isn’t big enough for the two of us. We’ll remodel it so that Bill has lots of room for work clothes, and I’ll inherit the armoire that he is currently using. The “nook”. 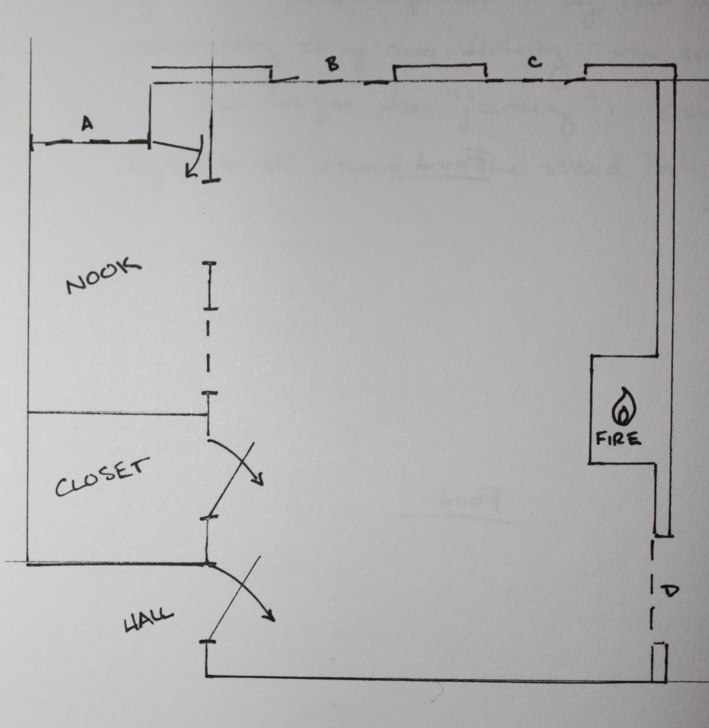 It is a small “room” off to the left side of the master bedroom, about 7′ x 8′ with a window and a cabinet built it. Originally, it could have been a dressing area, or a place for a crib. Lastly, once the painting is done, I’ll stencil and we’ll do the trim. But, we will also do the floors in this room to complete the whole thing. The middle of the room is bare wood flooring, as in, never been touched with any sort of finish. The outside, around the trim has a 2′ painted perimeter. Clearly, a carpet was in the room, and everything not covered was painted brown. 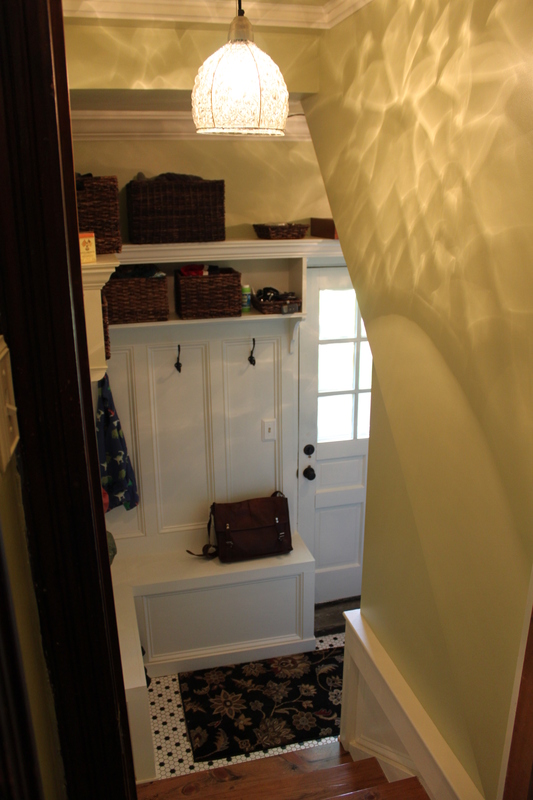 The upstairs hallway and small back bedroom are the same. However, the painted area is a mess, and we’re going to sand, condition, stain and finish the wood to protect it and make it sharp looking. If we felt we could maintain an original oil and wax finish, we would. But, we don’t really need more upkeep on this house than we already have. I’m aiming to get started on the floor before Thanksgiving, but it will depend on how quickly I can get the painting completed. I’m off to help Bill clean up sanding dust, hope you enjoy the update! Been a while. . .
We haven’t forgotten about the blog (or the housework), but early September has been a busy personal season for us. My parents came up from South Carolina for a visit and Bill had a work weekend with the local arts festival, Colorscape. So, we have been puttering around getting a few smaller projects done here and there, and my dad really helped us out with cleaning the garage. As I mentioned eons ago in one of my first posts, Bill and I had to clean out the house when we moved in. 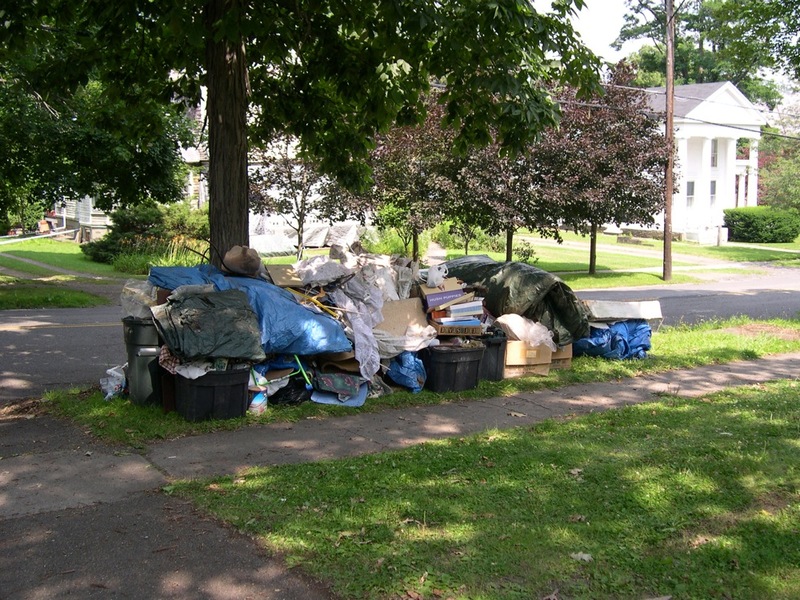 Up here in rural New York, it is quite common for owners to move out of their house and leave a LOT of stuff behind. . . like old paint and doors, or sometimes furniture and trash. 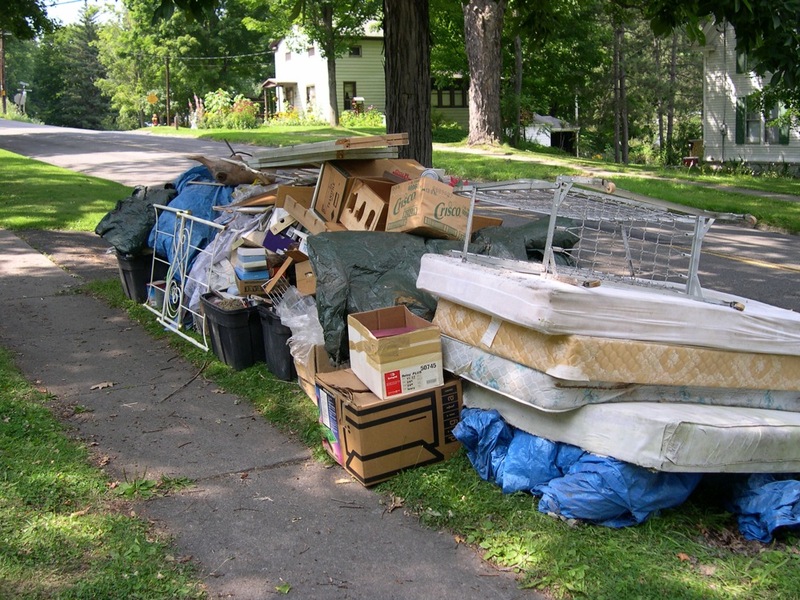 The pile that we moved out of the house had 5 mattresses, at least 3 old carpets, a baby bed, a box of hymnals, loads of wire hangers and just a lot of junk. The pile was the size of a large dumpster, but, we ultimately had a lot more to go. Since that first week, we’ve been taking trips to the dump to get rid of other stuff. But, mostly, we’ve been stockpiling the garage with all of this so that we could take it in one big trip (or 5 trips, as we only have a station wagon). With my parents help, we took 4 carloads to the dump last week. And, we put another 2 loads on the curb for freebies. Another rural NY anomaly is free curbside consignment. Anyone can put almost anything at the curb with a “free” sign and people will stop to gather in the treasure. Within an hour we had gotten rid of old plywood, broken book shelves and stacks of unused shingles. The only thing that has remained are some buckets of broken bricks. It’s truly amazing what people will pick up. I think my parents were astonished at how easy it can be to “get rid of” clutter by just putting it on the curb. Really, I’m astonished by it, too. But, we live in a deprived area of the country. People are resourceful here, and it is a gift to share what we can’t use. After the dump runs, my dad removed several old shelving units and swept out the whole building. We are left with a very clean garage, in which we think we can actually park both cars. It is labeled as a “one car” unit, but it is quite wide, so maybe we can get both cars inside for the winter storms. We still need to hang the tools and clean out the garage attic. 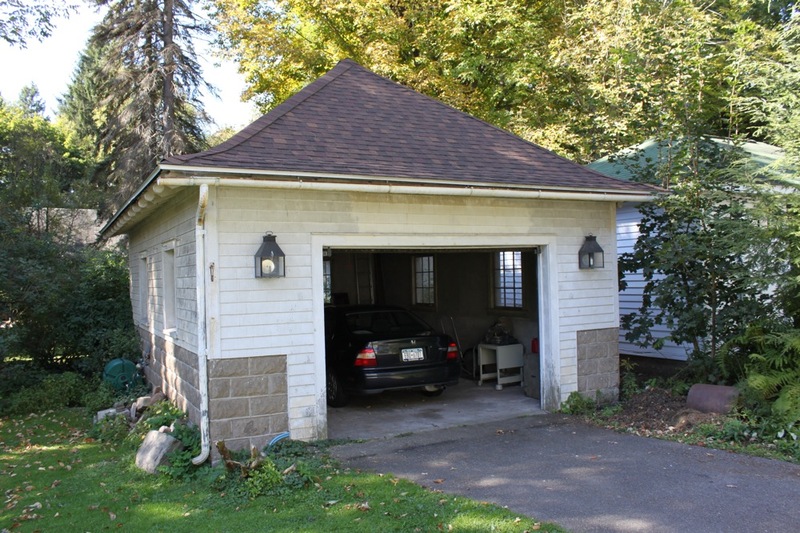 Yes, there is a garage attic, but there is no hurry. Right now, we can use the space a lot more easily than we have for the past year. Cleaned out garage, with room for more than one car! So, I think most of the big dump runs are behind us as we won’t need to tear out any more sheetrock or shelving. But this house holds surprises at every turn, so we’ll keep you posted. Posted on September 21, 2010 September 22, 2010 Author KarynCategories garage, Moving, Outside5 Comments on Been a while. . .